What do you get when you combine a badminton court, over-sized table tennis paddles and a Wiffle Ball? The answer, of course, is pickleball. The oddly-named sport combines aspects of badminton (it’s played on a doubles badminton court), tennis (the net is hung about three feet from the ground) and table tennis (players use large wooden paddles). Players hit a perforated plastic ball back and forth with the aim of forcing their opponent to either miss or hit it out of bounds. Games are played to 11 points and usually last between 15 and 20 minutes. The game, which is played both one-on-one and in pairs, was recently added to the program schedule at the North Delta Recreation Centre and is available at Sungod Recreation Centre and Kennedy Seniors Recreation Centre. It can also be found at many schools, community centres and seniors’ centres in Delta and across the region. According to Chuck Lefaive, founding director of BC Pickleball Association, the sport has grown quite a bit in Canada in recent years. In fact, he says, there are roughly the same number of players registered in the two Canadian national tournaments (about 800 between the western and eastern championships) as there are in their American counterparts. From July 8 to 10 and for the second year in a row, Kelowna hosted over 400 players from across North America for Pickleball Canada’s National Western Tournament. The city is already announced as the host of next year’s competition. For many the sport may seem to have come out of nowhere, but it actually predates the Apollo 11 moon landing by a few years. Pickleball was invented back in 1965, when then-Washington State Representative Joel Pritchard, Bill Bell and Barney McCallum returned to Pritchard’s home on Bainbridge Island near Seattle after a day of golf to find their families sitting around bored with nothing to do. As the story goes, the men tried to get a game of badminton going but were missing the necessary equipment. Instead, they improvised a game using ping-pong paddles and a perforated plastic ball, setting the net at a height of 36 inches so that the kids could play too. Over time, they developed a set of rules (based largely on badminton) and thus the sport of pickleball was born. Accounts differ as to the origin of the name. In one version, Pritchard’s wife Joan, an avid rower, named the makeshift game after the pickle boat in crew where oarsmen were chosen from the leftovers of other boats. The more popular version of the story is that the Pritchards’ dog Pickles would often grab errant balls and hide in the bushes, thus making them “Pickles’ balls.” Over time, the name was shortened and stuck. North Delta resident Carlos Felip has only been playing pickleball for a little over a year, but has already won tournaments at the North Delta and Sungod Recreation Centres. The retired professional volleyball player stumbled onto pickleball while on a transatlantic cruise in May 2015 and hasn’t looked back since. When he got back, Felip started looking for somewhere to play this new game, and found to his surprise that they were playing it across the street from his home at the Kennedy Seniors Recreation Centre. Felip says the strength of the game is that it can be played by anyone, young or old, and that players needn’t be particularly skilled or at the same level as one another to enjoy the game. Bill MacGregor, president of the Canadian Pickleball Federation, says the ease with which people of all ages and abilities can enter the sport is the key to its popularity and has made it an attractive addition to schools’ physical education curriculums. MacGregor says schools ought to work towards having competitive teams and play against one another, noting all of them already have badminton markings on their gym floors and many of them already have the paddles and balls. He adds the low cost of equipment (basic wooden paddles cost around $20 and the balls are a only few dollars each) makes pickleball an economic choice for schools, rec centres and players. 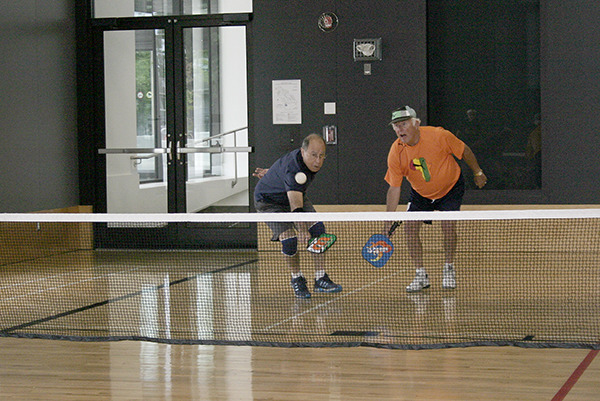 For more information on where and when pickleball is available, visit delta.ca/parks-recreation/activity-search.